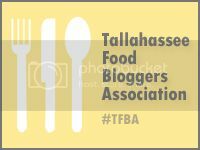 As part of the Tallahassee Food Bloggers’ Association “best of” awards, I have been visiting several restaurants that I had never heard of previously (hard to do being a Tallahassee native!) The nominees have been really interesting in many of the categories, and the Asian food category has been the most enlightening. The one that was a complete mystery was Tasty Eats Beer Garden, in the Railroad Square/Industrial Drive area. I looked on their Facebook page, and was intrigued by Pho Phridays! and the promise of authentic Vietnamese cuisine. The menu has traditional appetizers, noodle or rice bowls, and a variety of sandwiches/wraps, with some surprising entrees like Sheppard’s Pie. I definitely needed time to decide, so we asked for an order of Spring Rolls. I don’t even know how to explain why these rolls were so good. The wrapper was light and crispy, the interior was flavorful and moist. Even better was the spicy Asian mayo dipping sauce. I got the Beef & Onion Vietnamese Rice Bowl and the hubs got the House Noodle Bowl. 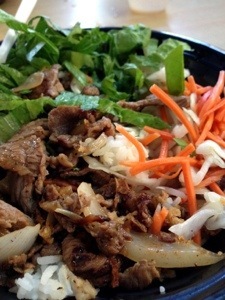 My Rice Bowl was a pretty arrangement of beef/onions, cabbage (lightly pickled) and carrots over rice. This was served with a Vietnamese Vinaigrette that was light, salty and sweet with a hint of fish sauce (one of my fave ingredients). The beef and onions were nicely spiced and the rest of the elements complimented each other very well, enhanced with a drizzle of sriracha. 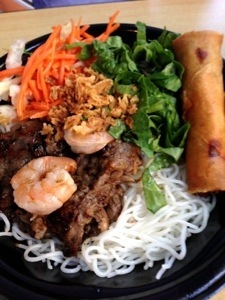 The noodle bowl was arranged similarly; the House version features beef and shrimp. The hubs enjoyed it, even though he wasn’t feeling very well. The crispy onions were a nice touch adding some additional crunch and flavor. 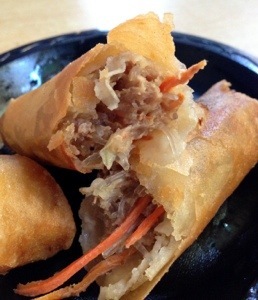 He even got another spring roll, which I completely coveted. The restaurant is housed in a blue and red caboose, in a great little artsy neighborhood that includes art galleries and vintage shops. They also have a large shady outdoor seating area (the “beer garden”) that looks like a great place to hang out, especially with the weather getting cooler. I would highly recommend going at lunch. We were the only customers today, but I would imagine that Pho Phridays are probably more populated. They are very active on Facebook, so make sure to “like” them so that you can hear about the specials and events. FYI: The map on Urbanspoon seems to point to the center of Tallahassee, instead of to the restaurant location. If you turn on Railroad Square from Gaines Street, you go over the train tracks and take a right onto McConnell Drive. Then take a right on Industrial Drive, it will be the blue and red caboose on the right-hand side.